Wadico welding respirators are designed for application such as welding, soldering and other operations involving metal fumes including those with ozone and nuisance levels of organic vapors. 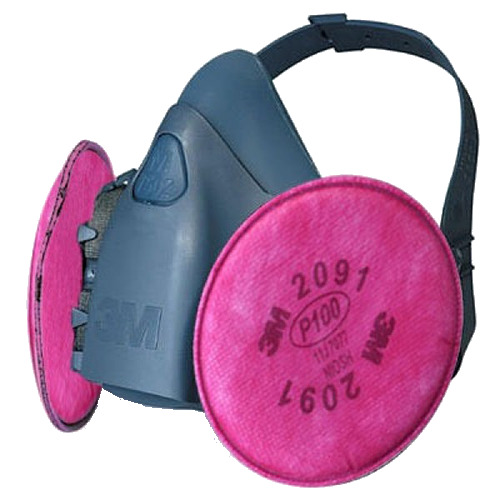 These product's many features help provide workers comfortable, durable respirators protection. - Solids such as those from processing minerals, coal, iron ore, flour, and certain other substances. - Liquid or non-oil based particles from sprays that do not also emit harmful vapors. - Metal fumes produced from welding, cutting and other operations involving heating of metals. Proprietary one-way valve offers easy exhalation for cooler dry comfort. - Provides relief from odors caused by nuisance level organic vapors associated with some welding operations. - Uniquely-designed filter layers reduce the caking of particles on the respirator surface. - Helps make the respirator breathe easier longer, which contributes to comfort, longer service life and increased savings. - Contours easily to help provide a good seal. - Helps provide a custom fit and secure seal. - Reduces the potential for eyewear fogging. A single tug helps provide a comfortable, secure fit. - The protective layers of this respirator are flame resistant as demonstrated per ASTM D2859-96. Not a substitute for a face shield. 1. The type of contaminant(s) for which the respirator is being selected. 2. The concentration level of contaminant(s). 3. Whether the respirator can be properly fitted on the wearer�s face. Do not use with beards, on other facial hair, or other conditions that prevent a good seal between the face and the face seal of the respirator. 4. Before use of these respirators, a written respiratory protection program must be implemented, meeting all the requirements of OSHA 29 CFR 1910.134, including training, medical evaluation and fit testing. These respirators contain no components made from natural rubber latex.